Apple is facing an uphill struggle in its attempts to wean Chinese smartphone users off cheaper rival devices in a saturated mobile market, according to a new Bloomberg report. With Apple gearing up to sell its most ambitious but most expensive iPhone yet, local competitors like Huawei, Oppo, and Xiaomi are already poised to compete by launching their own less expensive feature-packed devices around Apple's September 12 "iPhone 8" launch date. While it sticks to a global template that's served it well, local vendors have become adept at technology design while tailoring phones to local tastes, such as with dual SIM capability. In a show of confidence, Huawei Technologies Co., Xiaomi Corp. and likely Vivo -- far from front-running or avoiding the iPhone the way movie studios juggle summer tentpoles -- are tackling the U.S. company head-on by timing new products around the publicity avalanche sure to engulf Apple’s Sept. 12 launch. "The challenge comes from Vivo, Oppo and Huawei, they can replace Apple in high-end markets priced around $500, even as Apple remains dominant in the ultra high-end $600 plus segment," said Kiranjeet Kaur, an analyst with industry consultancy IDC. "We don't expect big growth as China's market is now very saturated. The biggest demand for the new iPhone will come from the replacement market." Part of the problem is that many of the features Apple will debut in its so-called "iPhone 8", such as a full-screen display and wireless charging, are already available in some form to consumers in China, albeit at a much lower price point. Adding to the difficulty is that local vendors have become more skilled at efficient smartphone design and are particularly adept at tailoring smartphones to local preferences. On the software side, the ubiquitous WeChat app has been described as the iPhone's "toughest rival" in the country. The app offers users an entire ecosystem where they can pay for services, text, call cabs, watch videos, play mobile games, and access cloud-based "mini programs", or apps that don't need to be downloaded to a device to be used. WeChat is said to have captured nearly 35 percent of each user's monthly smartphone usage time, averaging about 1 billion monthly active users in total. Combined, these market factors make it increasingly difficult for Apple to prise away users from rival devices and platforms, which doesn't bode well in a market which the company has historically struggled to penetrate. To counter these obstacles, Apple has previewed new features coming in iOS 11 that specifically cater to Chinese customers, such as QR code scanning with the native camera app, a keyboard that makes Chinese characters easier to input, and a new mapping app that shows traffic camera locations. 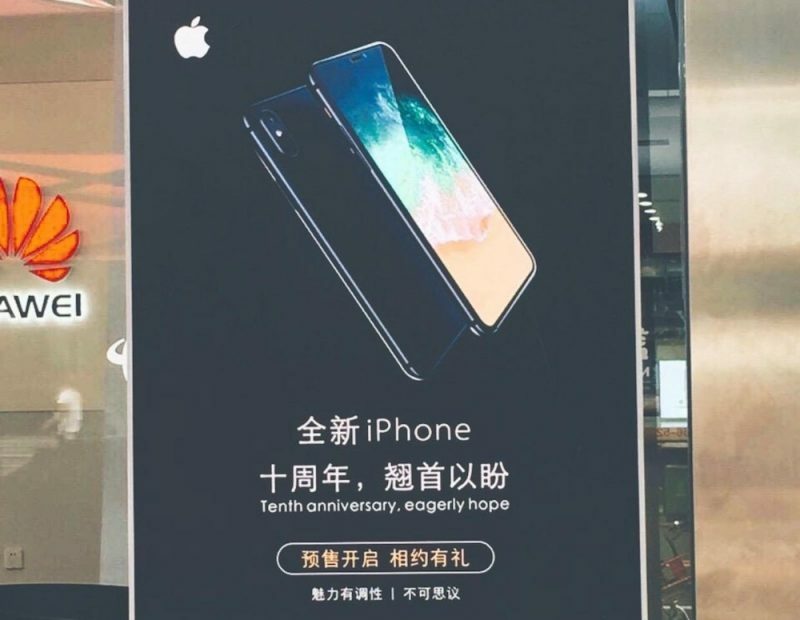 But with supply of new iPhones expected to be tight in the upcoming months, Apple's Chinese rivals may be seeing their best chance yet to lure buyers away with features aimed at local users, such as dual SIM devices that support multiple phone numbers, high capacity memory and storage, and advanced selfie cameras. Apple and the iPhone have taken fourth place in China, behind Oppo, Vivo, and Huawei, according to market research firm Warren Captial, while in April Kantar Worldpanel's data noted that iOS dropped to its lowest share of the China smartphone market since 2014. Canalys estimates Apple's Chinese smartphone shipments will grow by just 1.4 percent to 22.5 million units in the second half of 2017. Meanwhile, the upcoming OLED iPhone's rumored $1,000-plus price tag may end up pushing iOS fans toward local alternatives, "because even well-heeled buyers are price-sensitive", said Jia Mo, an analyst from Canalys. Update: In a lengthy post last week, Neil Cybart at Above Avalon came to a different conclusion, arguing that consolidation in the Chinese smartphone market has seen top vendors increase their shares more at the expense of smaller Android vendors than Apple. Cybart believes Apple's pricing premium in China means the company operates largely in a separate market from other manufacturers, and following the combination of expansion to China Mobile and the launch of the larger-screen iPhone 6 in 2014, it has been "much harder for Apple to find pockets of premium users in China ready to buy their first iPhone." The Chinese vendors make almost ~ $0 profit. It's a widely known fact that Apple keeps extremely high luxury-goods-like profit margins. It's still possible to make money from a "realistically priced" (i.e. sub $1000) smartphone. I think the iPhone is simply too expensive for that market. WeChat sounds like something that could even take off in the US if Apple had someone adept at managing services like that. It will be interesting to see Apple continue to tweak the communication and nascent commerce features on iMessage and see what it turns into. iMessage already is a really important part of the Apple Ecosystem and keeps people connected in the USA. I don't think that will help them in China, but it's not like the rest of us are chopped liver and our money is worthless, so Apple better not take the rest of us for granted. And if they stop being so greedy and trying to take a cut of things in ways that come across as really petty to people in the Chinese culture, they could become a stronger partner in WeChat commerce, too. Apple fell asleep at the wheel for the past few years. They let their desktop line atrophy. They let so many of their products coast. And still most of their products are very strong against the competition despite the extra bells and whistles of the competition. It would be amazing to see what they can/will do when they wake the hell up. Get in the giant metal donut and get cracking! The people who actually build the iPhones in the Chinese factories don't have a salary that would EVERY allow them to buy one of the phones they just assembled. And let's face it: The Chinese Android-based smartphones offer a lot of bang for the buck and come with a decent quality. There's no justification to drop four times the money for something that doesn't actually do anything more or even better. Who are these people? No one thinks Samsung's flagships are cheaper than iPhones. As for Apple dropping their price to $100 lower than Samsung? Sweet Jeebus that's funny. Apple isn't chasing market share, they're chasing what they've always chased: profit margin. Besides, trying to compete with Samsung on price sends the wrong message from a company stand point. Might be nice from a customer perspective, but Apple has a different customer perspective: Buy it or don't; somebody else will. It's worked for them so far. How is that different than the US, Europe, and well, everywhere else? In the US and Europe iOS and Android mean something. A lot of people prefer one or the other. In China the OS is less important than the app, specifically WeChat. If I am Chinese and spend the majority of my time in WeChat, what does it matter what OS my phone runs? Choosing an iPhone 8 or Galaxy Note 8 doesn't enhance my experience in any way. Never heard that. However, it _is_ often called the "Apple of the East" for its stage loving CEO and innovations. While Apple and Samsung together do average 90-95% of the total industry profits, that still leaves up to 10% (like four billion a year) for the other ones who are making money, including many smaller firms where even a million dollars is nice to get. For example, Huawei "only" makes a little over 3/4 billion dollars a year. True, that is only 2% of the total industry profits, but it is definitely not a loss either. The theft of our technological IP should be a huge concern yet the discussion consistently gets swept under the rug. I think the Chinese government is waking up to that themselves, as it even deeply affects their own. For example, there's a famous case of a Chinese firm making wind turbines for an American company, who bribed an American engineer to give them the critical control software. They then started selling the turbines on their own, leaving the American company out of the profit loop. So it was hugely karmic that not long after, that same Chinese turbine maker went out of business because OTHER Chinese companies stole both the turbine and its software, and sold them even cheaper. This is why Apple is pricing itself out of the market due to competition that offers a cheaper alternative that has existing technology or features. They need to get off their high horse and drop the premium BS. iPhone SE is more reasonably priced, IMO, based on my needs. Yes the iPhone SE is reasonable priced and competitive if it had the features of the 7 and 7 plus today. Apple is pricing itself out of the market. Maybe not in the USA but definitely in Europe and other countries where we get flooded with good build Chinese alternatives. This has partially to do as well with how easier it is for local vendors to offer their products compared to foreign companies. The western world should have never sold anything over there, they have stolen so much IP that the day is near where only Chinese companies will be allowed to offer goods and services. I was wondering why the focus on QR codes, it seems to be a nearly dead tech (from a consumer perspective) here.